With all the ultra-advanced technology and hurrying hubbub of this era, we've grown to be nostalgic for 'simpler' days, most especially during the holiday season. So, why don't you top off your Christmas decor with a vintage Christmas tree topper? It's not just capable of completing your holiday decorations and filling your heart with Christmas cheer, but it also gives your home more character like the ones we featured below. Check them out! You'll love this Star Tree Topper from Kurt Adler if you prefer a rustic Christmas decor. 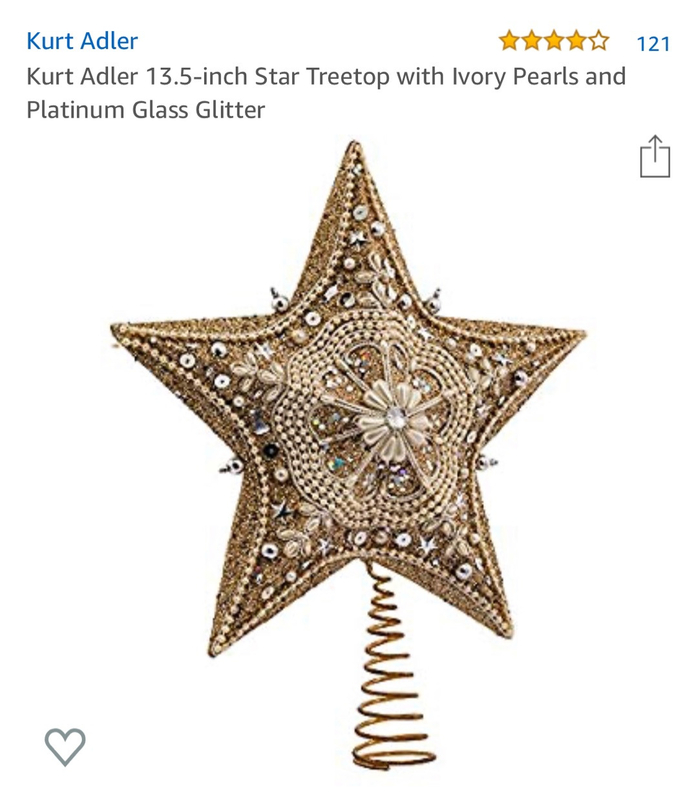 It's a 5-pointed star with platinum glass glitter and pearls that make this an elegant tree topper. Because of its intricate pattern and details, it adds the sparkle that any tree deserves even those that are already luminous! If you want to kick off your holiday decorating with a classic that will also add some shine to your tree, then this blingin topper that's embellished with sequins and glitter is your best choice! Whether you are all about the classic decorations and a tree that's finished with a traditional topper or you're thinking of adding a little something to your tree that's unexpected, then you will surely find this all-time favorite from Hallmark Home & Gifts a must-have. Even when it's a vintage tree ornament, it's a light-up one, so you get the best of both worlds! So, if you want the unmistakably classic angel tree topper with a modern twist, then give this one a thought! Any home can use a bit of kitsch this holiday season! Users love this stunning tri-colored star tree topper for its many features! It's not just lighted by a steady burning bulb, but it also sports numerous stylistic details, not to mention its unique retro look and feel. As a bonus, it comes with a metallic cone base that allows it to attach securely and easily to your Christmas tree. A vintage Christmas tree topper packed with amazing features? Sign us up! For a rustic look and feel, consider this Vintage White Lifering from Handcrafted Nautical Decor as your quirky tree topper this holiday season. There's no better way for you to celebrate the holidays than with the symbol of life. It's the perfect addition to your tree if you're looking for an ornament that makes an impression. Even better is it brings the beach to your living spaces! It's handcrafted, so there's no other tree topper like the one that you'll be getting. It also mounts easily on a tree. Bring some Christmas cheer into your house this holiday season with this eco-friendly rattan star tree topper! Once this indoor tree ornament is lit, its 10 clear bulbs will undoubtedly be your holiday setup's focal point. We love how it has a quirky 3D feel. It will no doubt pair really well with your cool Christmas stockings and other hip decorations for Christmas. Add that with the extra bulbs that are included in the package, a fuse, and rough but beautiful look, and you have the best vintage Christmas tree topper. It measures 11.5 x 10.6 x 2.7 inches, and it has a 60-inch brown wire, which comes in handy if you have a big tree. You don't have to be a professional interior designer to know that this Pale Blue and Silver Star Treetop is the perfect tree topper that completes a wintry Christmas tree! Reminiscent of both a snowflake and a star, it'll add the touch of sparkly elegance to your home. What we adore about this sparkly 5-point star from Kurt Adler is it follows the number one style tip for the holidays: choose glitter! Glam up your Christmas tree with this multi-pointed star tree topper that’s primarily made of capiz. Its natural construction, brass plated accents, eye-catching geometric shape, and clean lines aren't just what this specific tree topper has in store! Yes, that's right; it's one of the few Christmas decorations that have been thoughtfully crafted and packed with the best features. We're talking about the star tree topper's double sided-design that allows it to look amazing at any angle, its smoked capiz effect, faux pearl accents, and spiraled base for a quick and easy mounting! Are you looking for a winner? You’re looking at it! We are not going to lie; we are totally obsessed with Holiday Aisle's Angel Christmas Tree Topper in Sequined Gown as it couldn't get any more vintage than this angel topper. They don't make lots of this vintage tree topper anymore unlike before. Thankfully, you can still get your hands on it on Wayfair. It has fiber optics in the colors pink, green, yellow, purple and a lot more. On top of that, the angel features a delicate head resplendent with luscious locks. Stocks of this vintage Christmas tree topper are limited, so hurry before they run out! This Homespun Angel Tree Topper is the most authentic touch you can give to your Christmas tree. The earth-toned angel hearkens back to a different era of Christmas celebrations. It comes with a bow wrapped around the angel's waist and twig wings that are decorated with leaves and berries. The dark brown fake fur trim accents the angel's deep red and tan gown for the warmest and most inviting tree topper. As it's 16 inches tall, she will preside over your Christmas tree until Santa shows up.